I will start where we left off with the previous blog entry: Maintenance does not wait. A steady list never seems to get shorter with new projects added as others are checked off. The big project, along with changing the oil in the main engine and generator and a dozen other small tasks, is to re-bed the chain plate covers on the deck. Half way through the project we saw a boat arrive in the harbor with their mast and rigging, sail included, dragging beside it in the water. 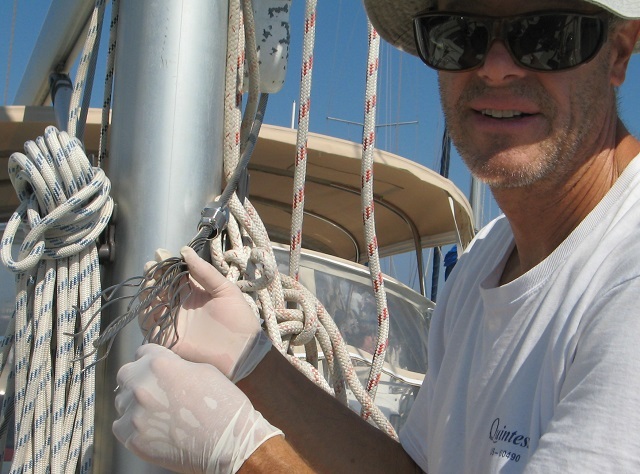 The story is that they had sailed the boat from the Caribbean to Greece and lost their mast when two bolts on the chain plates sheared from corrosion. They were very fortunate that it happened here and not in the middle of the Atlantic. It made us realize that this project is time well spent! As with all projects there are occasional curve balls. 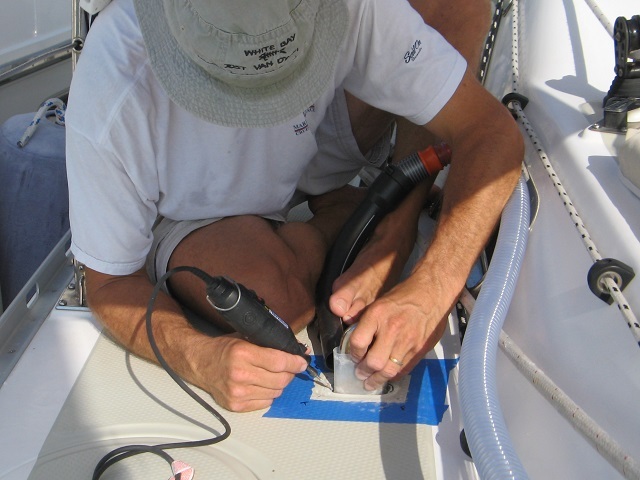 Bob was up on deck grinding out the chain plate recesses with a dremel while using the vacuum to catch the shavings. Sara was working below when Bob yelled frantically to turn off the vacuum. The canister is in the workshop and has a 25 foot hose that he ran out the shop window to the deck. At some point the end of the hose went overboard and was sucking up the Mediterranean Sea! Once the vacuum was off and unplugged, the real work started. Bob started dissecting the vacuum while Sara got online and started googling “water miele vacuum”. Every site basically said the same thing–buy a new vacuum cleaner. Not likely. Bob rinsed every part, including the motor in fresh water. We dried everything in the sun on the cockpit seats for over a day. After replacing the filters and bag we were back in business. The vacuum is working and the chain plate project is back underway. 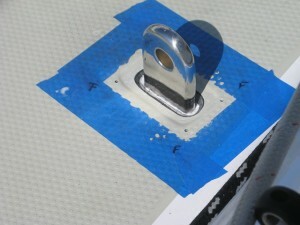 On a technical note: the chain plate covers were redone before we left at our boatyard in the states. They used Sikaflex to refill the cavities under the covers as is pretty standard procedure. Over two harsh seasons of Mediterranean heat and weather, we noticed the caulk separating from the metal chain plates in many places. In an effort to improve the longevity of the periodic service, Bob researched a lot of information on the internet. A recommendation often found was to use butyl rubber rather than caulk as it remains flexible and adhesive for ten to twenty years. Bob had experience with the butyl rubber material from our last boat and was highly impressed with its performance, so this made sense. 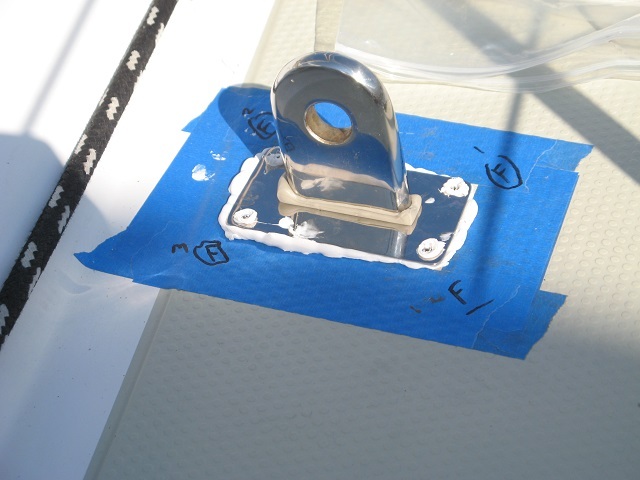 The next step was to extract the old caulk, shape the recesses with angled sides to better receive the non-liquid material, fill the cavities and re-bed the covers. While we had the rigging disconnected, some of the Sta-lok fittings looked suspicious so these were taken apart, cleaned and reassembled. Taking the rigging fittings that hold the mast up was a little intimidating but after having done it we are now a lot more comfortable if we ever have to in an emergency. The chain plate cover project was completed for four of the six side chain plates and we are pleased with the process we developed and the results. Time will tell if we have come up with a better mouse trap. The other two chain plates should go fast but will have to wait until the next time we are back in Kos to finish it. It was not all projects though. 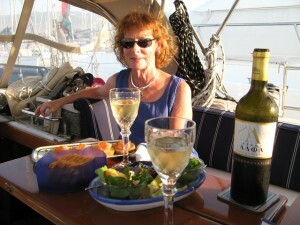 We found time to celebrate Sara’s birthday with wine and appetizers in the cockpit, and dinner out at a new restaurant overlooking the water and a beautiful sunset that evening. 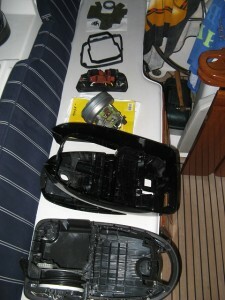 Kos is a charming island but a challenge for finding boat parts. Marmaris, Turkey totally spoiled us. Bob rented a bike and is getting lots of exercise riding all over seeking parts. The few boat chandlers have very small inventories. We are now wrapping up all open projects to get the boat ready to head north again. Liked your technical notes on the chainplates. Will have to discuss next skype/call. Sara birthday mate is doing well, now over 6 lbs.